Calcined mica flakes and calcined mica powder is produced by calcining Mica, at 850 degree celsius by K-Oil treatment method. It is used in pearlescent pigment industry. 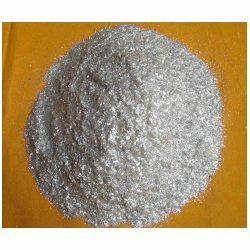 We produce both calcined mica flakes and calcined mica powder of any required mesh size. 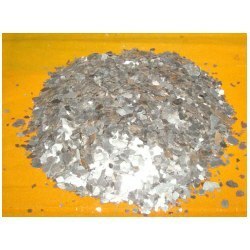 We offer Calcined Mica Flakes to our cliens. This is calcined mica flakes (2-8 Mesh). The calcined mica flakes are made first out of mica lumps/scrap through a pulvigator and screener. Then it is heated at a temperature above 850 degree celsius for about half an hour with K-Oil treatment. The final product is what you see in the picture. We offer Calcined Mica Powder to our clients. This is calcined mica powder (2-8 Mesh). The calcined mica powder are made first out of mica lumps/scrap through a pulvigator and screener. Then it is heated at a temperature above 850 degree celsius for about half an hour with K-Oil treatment. Then the flakes is taken to the pulverizer & milled & screened to become powder of the required mesh size. P.S - calcination of mica powder is very difficult due to its light weight. So instead mica flake is calcined & then milled. Looking for Calcined Mica Flakes/Powder ?